I have not been Little M’s favourite person at all this week! I think she must be going through a leap. Daddy is definitely the favoured parent! Fortunately, he’s still off on his summer holidays, so I can just hand her over and let them get on with it. Which is helpful when I’m being smacked around the face and generally having all of my polite requests to play or cuddle refused! I’m trying not to take it personally. I know it’s just a phase. Fortunately, there have been just enough kisses, cuddles, smiles and kind moments from her to see me through! I know Little M loves me really. Hopefully she’ll have got over it by the time September rolls around, as she’ll be stuck with me then! Having said that, pretty much all routine that we had before the summer holidays has gone out of the window, plus she’s teething, so it’s not surprising she’s in a bit of a grump. We’ll get back on an even keel in a few weeks, I’m sure! Speaking of routine, we seem to have solved the ongoing saga of will-she-won’t-she drop a nap. We’ve managed to hold out until around 10am before putting Little M down in her cot for a sleep, and she’s been having a good 2-3 hour nap. It’s then been a mission to keep her busy all afternoon so that she doesn’t realise that she’s grumpy and tired, and we’re trying to be more organised with dinner time to get that on the table by 5:30pm, too. We’re pretty rubbish at that though, and even when we plan our timings, we still seem to generally be 10-20 minutes late, with a bad-tempered Little M shouting for her meal! We really need to get more organised and start dinner an extra 20 minutes earlier, but that’s not so simple when you’re attempting to actually have nice family days out around the napping and the meal times! On the topic of family days out, we had such a nice time at Sheringham the previous Friday, that we decided to return with the in-laws on Monday. Little M wasn’t quite so taken with the sea this time though, despite repeatedly asking to go in! Never mind! This week we’re off on holiday to the West Sussex coast, so hopefully she’ll have more seaside experiences there. 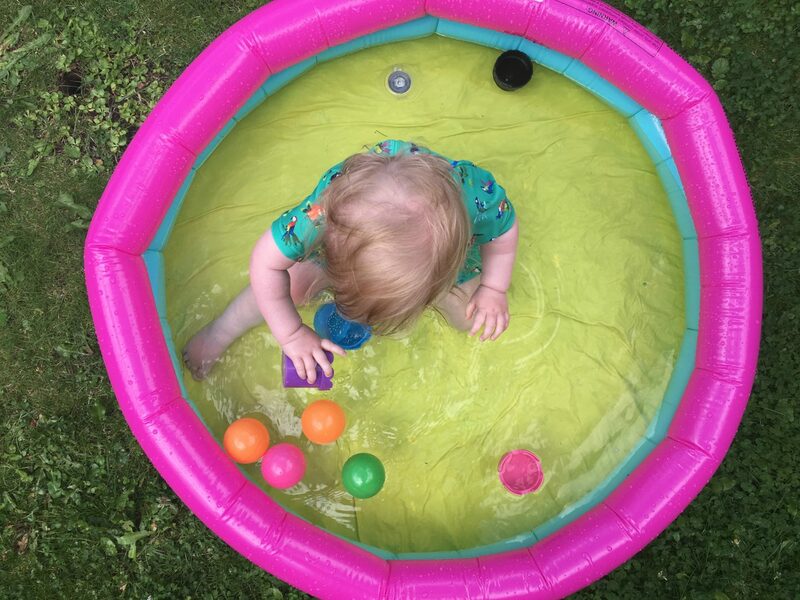 Later in the week we got the paddling pool out in the back garden and Little M had a play in there. She absolutely loved sitting in the water, but in most of the photographs I took, she’s pulling the most serious of faces! So instead I’ve decided to share this aerial shot of Little M playing with her cups and balls in the pool. It wasn’t as sunny as I’d have liked, so I kept boiling the kettle to top up the paddling pool to warm it up a bit. It was more of a bath than a paddling pool, really! Little M loved playing in there and just as we were worrying she was maybe getting a bit chilly, Grandma arrived so Little M wanted to get out and say hello. Perfect timing! So we got her all towelled off and changed into some nice dry clothes. Within about 5 minutes she was asking to go back in again! Obviously a winner of an activity, then. Let’s hope we see some more sunshine this holiday so we can do it again! We had it out again yesterday! Thank you, I hope it does! It’s hard work, isn’t it? !